"Perfume" is thorougly engrossing. It is like a heavy scent that you can't resist smelling over and over but never really sure if you would want to wear it yourself. Like scent, it is a novel that really needs to be experienced rather than merely described. 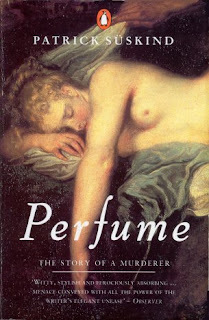 Perfume connected me to my own sense of smell, and strangely you feel like you are smelling your way through the book in addition to reading it. Perfume is the story of Jean-Baptiste Grenouille who is born in Paris in 1738. As a new born baby Grenouille is found abandoned in a pile of rubbish. The story follows Grenouille's life and the troubled relationship he has with his fellow man. I really dislike reviews that give substantial parts of a plot away in any case. I feel that my enjoyment of the novel "Perfume" partially comes from the fact I knew nothing about it and the Penguin Classic book cover gave very little away about the story within. In many ways this is a very intimate depiction of a soul who feels thorougly cut off from, and superior to, everyone else in the world. Grenouille is insane; we walk in his shoes and it is very disturbing. The language is powerful and arresting. It was only after I finished reading this book that I learned that the novel was originally written in German. I can't imagine that anything has been lost in the translation as the story flows beautifully. The narrative builds slowly and crescendos horrifically. I had to reread the ending a couple of times because I initially couldn't take in the full hideous implications of it. With that, it is a thorougly satisfying ending. Perfume is like a truly grotesque piece of art that you can't take your eyes off. It is original and confronting and really does make you think about your relationship with your own sense of smell. I loved it........I think.